Do you want to show or hide questions on your form based on the options the user selects? You can declutter your lengthy forms and increase your completion rate using a special feature called conditional logic. In this tutorial, we will show you how to create customized forms with smart logic. Creating smart forms by using conditional logic on your forms will greatly increase the number of form entries you receive, because it makes it easier for your website visitors to fill them out. Now we’re ready to add some conditional logic. Want to show a follow-up question when the user picks a specific answer? It’s easy. 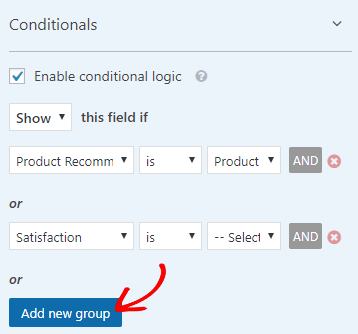 Select the field you want to have appear and scroll down to Conditionals within the field options. Select Enable conditional logic and Show. Then in the options, select the primary question. Depending on the answer they give for the primary question, the follow-up question will display. You can also choose to hide a field based upon an earlier answer, just like in the previous example. Just select Hide instead of Show. While you’re here, also take a look at the different options that will help you narrow down exactly when the follow-up question will display. Let’s say that you want to display a field only if the user selects two specific options. Select the AND button to add a second criteria. Your new field will only display if both of the prerequisites are met. When you want to display a new field if a user selects either of two answers, then you’ll want to use the OR option. To make this work, select Add rule group. The same smart logic used in the field options can also be used in your email notifications as well. Go to Settings » Notifications. Then scroll down to Enable conditional logic. You can send an email notification based upon how a user answers the form questions. All of the methods listed above will also work for your notifications. Now you’re all set! You’ve created a customized form with smart logic. When users fill out a form on your site, they will only see questions that are relevant to their needs. You might also want to check out our guide that will save you time by having your form field choices automatically created and updated for you. Hey folks! Does WPForms smart logic enable us to calculate pricing based on options chosen? That would be excellent! Hi Jad! Thanks for your comment 🙂 WPForms can easily calculate pricing based on options chosen using the “Total” field (located under Payment fields). Here’s a tutorial on creating a simple order form in WordPress. If you need any help setting up your form, feel free to get in touch! Hello, if I’d like to show a field if the previous one “not empty”, how can I do it? Hi Gian! Unfortunately that’s not currently possible, but that feature is definitely on our radar & will be added in the future. You can subscribe to the weekly email newsletter (using the form in the sidebar) if you want to be notified as soon as new features are released. I’m trying to enable conditional logic but the select field is not populating? Any suggestions as to why it’s not. I’m asking if you have ever registered a course at this college, and using the checkbox the user picks yes or no. If they choose yes then conditional logic is to kick and have them enter their student number. I’m not getting any of the fields populating? Hi Marie! We’d love to help you out with this. If you drop us a line through our Contact page we can take a quick look & help you get it working right! I figured out the issue. One other question, I found a code snippet I’d like to use to change the submit form – but where do I insert the code snippet? It doesn’t work in the CSS Classes in WPForm. You can add CSS code to your theme by navigating to Appearance » Customize » Additional CSS from the WordPress dashboard. You can see our tutorial on how to style contact forms with CSS for more details. If you run into any issues, our support team can help if you use the contact page. Hope that helps! I have a problem. 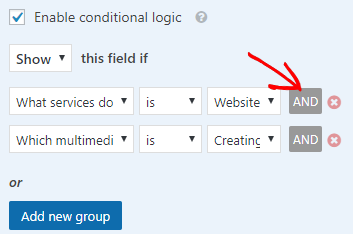 When I select a field to be “Required” but only shown upon certain conditions, I noticed that it will still be “Required” even it is not shown (i.e. even if the conditions are not met. It should only be “Required” if the conditions are met! Furthermore, I would like to change the language in the progress bar where it says “Step 1”. How can I change it to my language? Currently, the field conditional logic applies to the fields visibility. 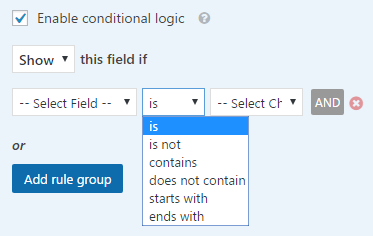 It does not dynamically change the field’s “Required” setting on the fields. 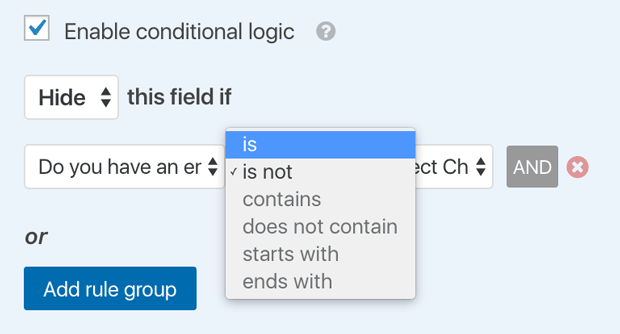 More complex conditional logic calculations, such as dynamically toggling a field’s required state, is something we plan on adding in Q2. It’s been a popular request and we look forward to providing that feature in the near future. Can the conditional logic determine the destination after the form is filled out? If they answer a question yes or no send them to a different pageafter the form is complete? Hi Angela, great question! Currently, conditional logic can be used for email notifications, but not for the confirmation settings. (The Confirmation settings menu is where you can choose to display a message or redirect users to a specific page or URL.) That sounds like an awesome feature, though! I’ll put in a feature request for you. I’m using conditional logic on my Wpforms, but when i try to send message, NOTHING ! Because some hidden (and required fields) for another option are not selected. For example, i have on my form, “Company” and “Blogger” option, and when you select “Blogger” you don’t see some required fields for “Company” so it’s impossible to send message because the form ask to fill all that fields before. How to fix this please ? 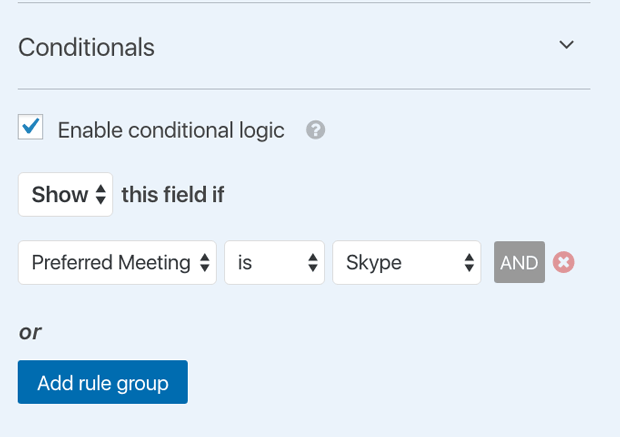 Currently, the conditional logic works for field visibility, but it can’t dynamically change the field’s “Required” setting on the fields. So, users may not be able to submit your form if a required field might be hidden by conditional logic. We’re working on a feature to dynamically toggle a field’s required state, which we plan to release this year since it’s a popular request! If you’d like to be notified as soon as new features are rolled out, you can subscribe to the weekly newsletter using the signup form in the sidebar & footer of this page. I want to make a form for activating and starting warranty from date (until one year for example) by build numbers that I listed before and another one for checking validation duration of warranty. Can WPForms do this kind of operations? i can do it with this smart logic? Yes you can absolutely use conditional logic to set this up. Here’s our tutorial with a very similar example to what you’ve described. I’ve tried to use more than one form on a wp-page. But only one really works. The other ones always change if i click s.th. in the first one. I apologize for the trouble! We have lots of users with more than one form embedded on the same page, so I’m not sure what might be causing the issue you’re seeing. When you get a chance, could you please drop us a line in support so we can assist?